Michigan Uniform Commercial Code - Michigan Legal Publishing Ltd. 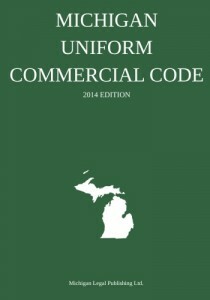 The Michigan Uniform Commercial Code contains the complete official Michigan Uniform Commercial Code (UCC) text and is intended for use as a quick reference. Information is arranged in one softbound volume and is arranged chronologically by code articles for fast and easy access. Updated through March 1, 2014.